The Georgian era is often referred to as The Age of Elegance. The most important element in Georgian Interiors is perfect proportion alongside carefully balanced colours. Georgian rooms typically included several decorative features such as plaster and stuccowork, elaborate doorways, panelling, gilding or marble effect paint work. 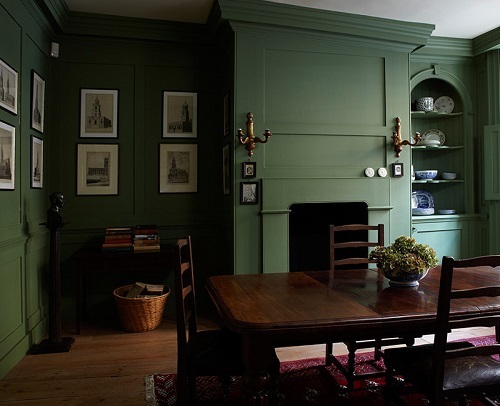 The colours used were muted and sophisticated, a look perfectly suited to the Farrow & Ball palette. To create this look chooser dirtied colours like ‘Mouse’s Back’ No. 40, ‘Dead Salmon’ No. 28, ‘Lichen’ No. 19, ‘Pigeon’ No. 25 and ‘Picture Gallery Red’ No. 42. Typically these would have had a sheen so Modern Emulsion would be the most appropriate finish to choose. As the style evolved, colour became lighter with the use of dusky pinks like ‘Setting Plaster’ No. 231, soft greys like ‘Pavilion Gray’ No. 242, and cleaner greens and blues like ‘Folly Green’ No. 76 and ‘Lulworth Blue’ No. 89 as well as the introduction of strong yellows like ‘India Yellow’ No. 66. All these would be used in a matt finish like our Estate Emulsion. If you are lucky enough to have original plaster work or panelling then colours like ‘Off-White’ No. 3, ‘Fawn’ No. 10 and ‘Olive’ No. 13 would be most appropriate.